Black cat pictures are among my favorites. These enigmatic kitties have always captured my (and other people's) imagination. Who can resist a black cat picture or a picture of a black kitten? I love looking at pictures of black felines. They have a unique appeal, a special, almost otherworldly beauty that has inspired artists and poets. Indeed, black cats are frequently used as symbols of the mysterious. They are also associated with sorcery and magic. Pictures of black cats and black kittens make a great gift for cat lovers. Posters, prints, and calendars of black cats make wonderful and affordable presents. Below you will find fun information about black cats and additional gift ideas. You will also find a poster store powered by allposters.com. Would like to share your own black cat pictures and stories? Submit them using this form. Throughout history, black cats have been associated with superstitious beliefs, mystery and magic. Here are some of those superstitions. In the past, and even today. some people believed that black cats brought good luck. At the same time, others believed that cats attracted bad luck. Ancient Babylonians associated cats with evil and they compared them to serpents. During the middle ages, cats were believed to be demonic creatures. In those days, people thought that black cats were witches. People also believed that black cats brought bad luck. Around that time, many Europeans believed that cats were omens of death. It was believed that if a black cat crossed your path, danger was imminent. Many cats were killed during that time because of such superstitious beliefs. In Great Britain, it is considered good luck if a black cat crosses your path. In Scotland, if a black feline sits on your porch it's also considered good luck. In Japan, people believe that black cats ward off evil spirits. In the 1300’s, there was an outbreak of the bubonic plague, a contagious disease transmitted from person to person or by the bite of infected insects, such as fleas (fleas would catch the disease from an infected rodent). There's a theory that suggests that, during this time, people started to bring cats into their properties to combat the mice problem. 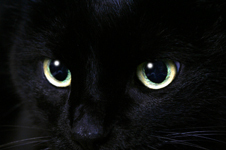 -- The black cat is one of the Wicca religion's many symbols. -- Nowadays, black cats are very popular decorations during Halloween. In addition, many people believe that black cats bring good luck. -- In general, black cats are very popular among cat owners. Since ancient times, cats have been associated with witches. In witchcraft tradition, cats are believed to be familiars of witches. A familiar is a spirit who obeys and serves the person associated with it. Black cats have been particularly linked to witches because of their color. In the past, many witches have claimed that they could change their shape into that of a cat (this ability is known as shape-shifting). During witch trials, cats were also burned alive along with their owners. For many people, just the fact that a person owned a cat was proof that that person was a witch. A black cat is the main character in Edgar Allan Poe’s short-story "The Black Cat". The black cat was adopted as an anarchist symbol. "Sabrina, the Teenage Witch" (TV show) featured a talking black cat. Felix the Cat, a black cat, is one of the best known cartoon cats. The Bombay is the only all-black cat breed. Black cat pictures make wonderful cat lover gifts. Here are more gift ideas inspired by black cats. Want to share your own Black Cat Pictures? If you have pictures of your black cat or kitten, please share them! And while you're at it, tell us about your black kitty. Does he have a special hobby or talent? Does she like a certain song? Do tell! Do you have a picture to share? Great! Click the button and find it on your computer. Then select it. Does anyone know what type of cat this is?